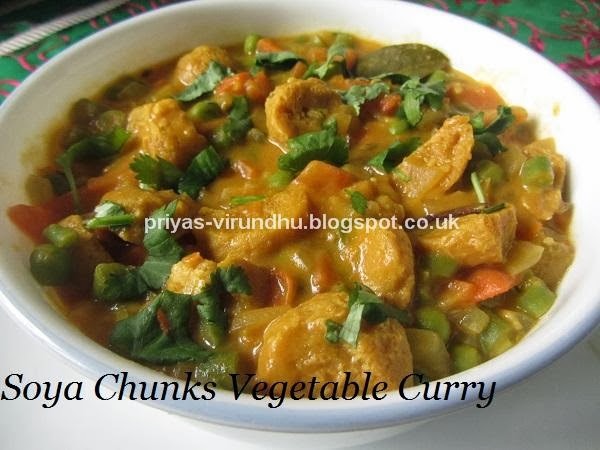 Today for the third consecutive day I am posting another very healthy and delicious Soya Chunks Vegetable curry. My mom used to prepare this vegetable soya curry very often as side dish for dosas and chapathis when I was a kid. Do try this curry and let me know your feedback. Are you looking for a quick and easy evening snack??? Then here it is, you need not soak, you need not grind, just make this spicy, delicious and mouth-watering evening snack with the ingredients available in your pantry. Make this Soy 65 before your kids come back from school; ask them to guess what it is? The first answer will be, if it is chicken 65. Yes, Soy 65 looks and tastes like chicken 65, so what are you waiting for? Go ahead, try it out and play the guessing game with your kids. 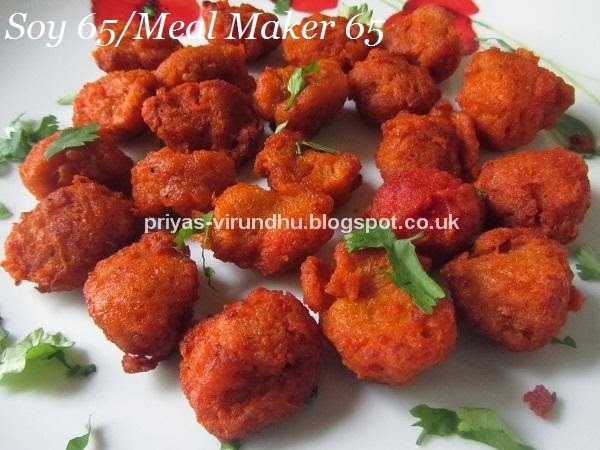 Here’s how to make Soy Chunks 65 with step by step photos…. Soya chunks/Textured Vegetable Protein (TVP) are defatted (fat removed) soy flour product, a by-product of extracting soybean oil (Wikipedia). 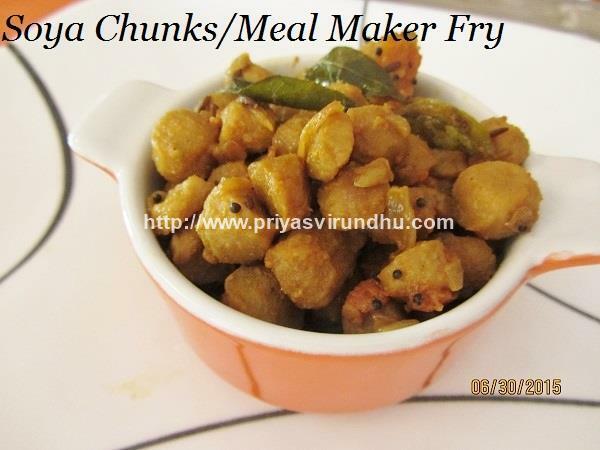 Soya chunks are excellent meat substitutes, cooks quickly with protein content equal to that of meat. 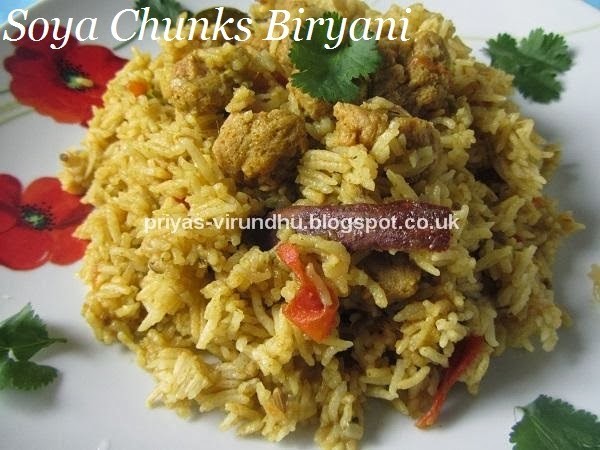 The soya chunks were invented by agricultural commodities and food processing company in the 1960’s. They come in many forms like regular chunks, mini chunks or also as granules and can be used in different ways. Soya chunks are excellent source of protein which helps in body building, cell repair, building immunity and muscle growth. About 3.5 ounce of soya chunks contains 54 gms of protein. Soya chunks have high concentration of calcium and iron. Studies also show that soya chunks help in lowering cholesterol, osteoporosis, blood pressure and helps in weight loss and many more. Having said so many things about soya chunks, now let us see how to make this simple, flavourful and delicious Soya Chunks Biryani in Pressure cooker.